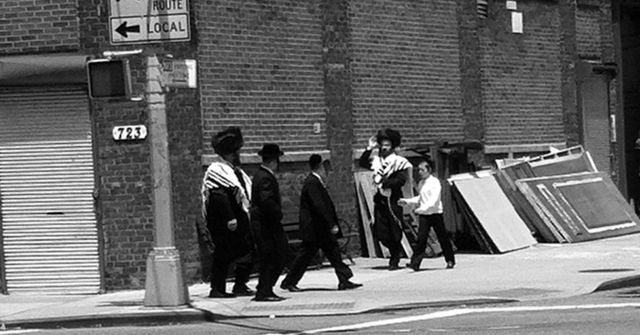 Hasidic Jews are a fascinating subculture in the melting pot that is New York City. These people brace themselves against the heavy current of the modern city with strong social order and a highly insular community. Densely Hasidic areas in Brooklyn were once considered remote but the geographical boundaries that protected them have faded as the city grows and encroaches on their once-isolated neighborhoods. Now the Hasids in Brooklyn (much like the Chinese in Chinatown) must rely on a combination of intra-community lending practices and their profound strangeness to protect them from being swept away. In contrast to the remainder of New York culture where people alter their appearance to be more than, to stand out, Hasids make every effort to be as similar as possible to one another. From my outsider’s perspective, the Hasids seem to be quite literally cut from the same cloth: everyone wearing essentially the same clothing as everyone else of their age and gender. Hasidic women select dresses and stockings and even wigs in such a way as to become indiscernible from the next person. From a young age, boys start growing out the hair beside their temples, which is styled with a curl in single long coil. On the Sabbath, men wear large cylindrical fur hats that are hilarious from without but must surely be impressive within the inner circle. Such eccentricities of appearance simultaneously separate the Hasids from everyone else and merge them with each other. Commuting across the Williamsburg Bridge a few times a week, I became accustomed to the familiar sight of Hasidic Jews walking along the pedestrian pathway. Unsurprisingly, strict rules of conduct seemed to dictate Hasids’ bridge-walking culture as well: groups tend to be segregated by gender, age and time of day. I noticed clusters of elderly men and sometimes boys traveling the bridge in the early morning and late evening hours- commuters like me. Women on the other hand tended to gather in groups of only two, pushing strollers while they fast-walked quiet-talked their ways along the bridge for some midday exercise. Rarely did any member of this flock stray from the script of clothing, social pairings, activity, and behavior. There is only one portion of the pedestrian route of the Williamsburg Bridge where walkers and bikers share a path- only one chance for the world of Hasids and Hipsters to collide– and it was here, on my evening ride home one day, that a young Hasidic girl captured my attention. The mere fact that she was alone was surprising to me. I watched in wonder as, after a tentative glance over each shoulder, she broke out into a run. With her jacket tied around her waist, sleeves flapping in rhythm with the carefree stride of an adolescent, she headed into the long upward slope. She didn’t run in the goal-oriented way of an adult– running to a meeting or running to burn calories. She ran like a child or an animal– running for the sake of running. It wasn’t graceful or athletic, it gangly and awkward and yet, as a pure act of freedom, it was absolutely beautiful. I’ll never know what was going through her mind but it seemed to me that I was witnessing something special. I imagined that she was rarely, if ever, alone; I imagined that she never really got a chance to run; I imagined that she seized the moment of that very public yet very anonymous space to break out. I wanted to honor the purity of the moment without breaking the spell. I didn’t call out to her, or make eye contact or even turn my heard. I just rang my bell and grinned to myself, happy to give homage to acts of personal freedom everywhere, no matter how small. This entry was posted in Non-Fiction and tagged bike new york, brooklyn, hasid, new york city, spokenwords, williamsburg. Bookmark the permalink. I really enjoyed this story of breaking out! I don’t mean to dump on your site but I really wanted to share an experience of mine that keep resonating with me as I read your story, an urge I had to break out. Something I wrote in a crowded library during finals week. I can break the self-oppression NOW!